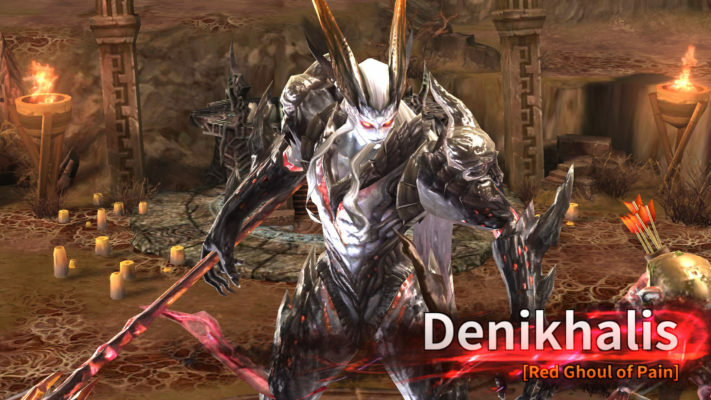 Released late last year globally, Devilian was a unique MMORPG that had an immense amount of potential that didn’t necessarily live up to expectations. Regardless, it still has a decent reoccurring fanbase thanks to its beautiful artwork and fast paced gameplay. Well it looks like the Bluehole isn’t quite done with the Devilian name just yet as the Korean-based developer has teamed up with Gamevil to bring a similar MMORPG, hack’n slash experience to the mobile platform. We were able to get some hands-on time with a beta version of the game and our impressions are generally positive. It’s not quite what we’ve come to expect from the Bluehole name, but there are some things within this mobile version that have the potential of making Devilian for mobile shine. Right from the get-go you are given the choice between three different characters: Kylar, Ayla and Elin. Kylar is very much the traditional warrior class who swings around a giant blade with a berserker Devilian form available whenever the purple meter fills up. Ayla a unique mage with two spiked chakrams that deals in quicker, flashier combat. Her Devilian form is even deadlier, swapping out the chakrams in favor of two lengthy blades attached to her gauntlets. Last but not least is Elin, an adorable cat-like character who swings around a scythe larger than her own body. Her Devilian form acts more like a rogue individual, dealing primarily in speed more than anything else. 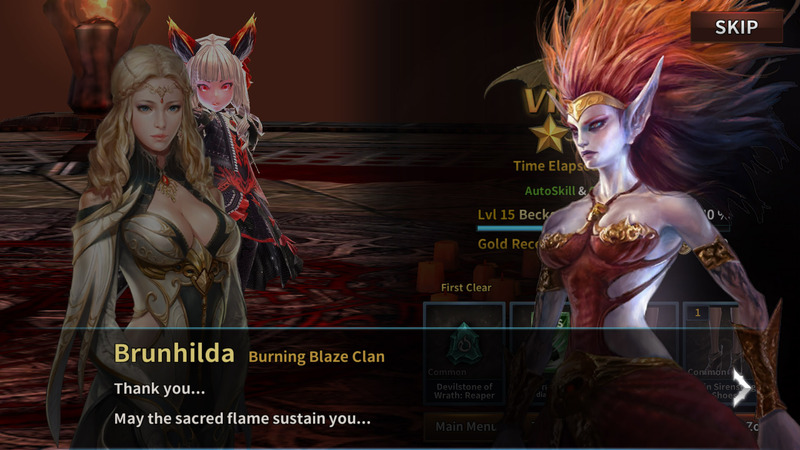 Each character has their own unique traits and abilities that help them differ the experience up quite nicely, although we primarily stuck with Elin from our short time with the adventure. Continuing on with the various abilities each class holds, how skill points are distributed is quite refreshing. Depending on the situation or current loadout, your character could need a boost in specific categories. What Devilian does is handout skill points to specific attributes such as HP, attack power, critical rates, and so forth, but doesn’t make it permanent. This applies to both passive and active skills, so players have the means to modify their character on the fly. For example, if you’re going up against an enemy with high fire damage, you could reassign some points into fire resistance, or maybe just boosting their skill power. It’s curious why players are able to purchase skill points for in-game currency as it might lead to aiding primarily those who open their wallets over the skilled, but at least it seems like there is a cap on how many times players are able to do so. Speaking of the in-game currency, being a closed beta, there wasn’t any in-game transactions going on, so it was difficult to gage what a single gem is worth in real currency. What players will spend their gems on is primarily better equipment, but based on the shop, it feels very scarce. Equipment is ranked in various stages, but the options in the shop only offered Rare gear, third on the long scale, and just one additional rank above that if you bought ten pieces at a time. Players should be able to get more gear outside of this by participating in the activities, but it does serve as a good starting off point and definitely helps progress early on. Outside of equipment, gems can also be used to obtain stamina for the various modes and gold that’s used to fortify equipment. It should be interesting how Bluehole and Gamevil will incentive players to continue racking up their gem counter. Being a mobile game, the combat has been simplified quite a bit. 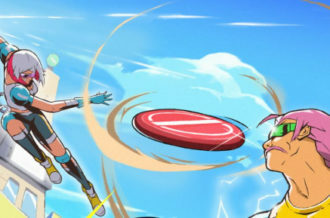 There’s a regular attack button that will unleash upwards of a five hit combo and two abilities that can be equipped at a given time. 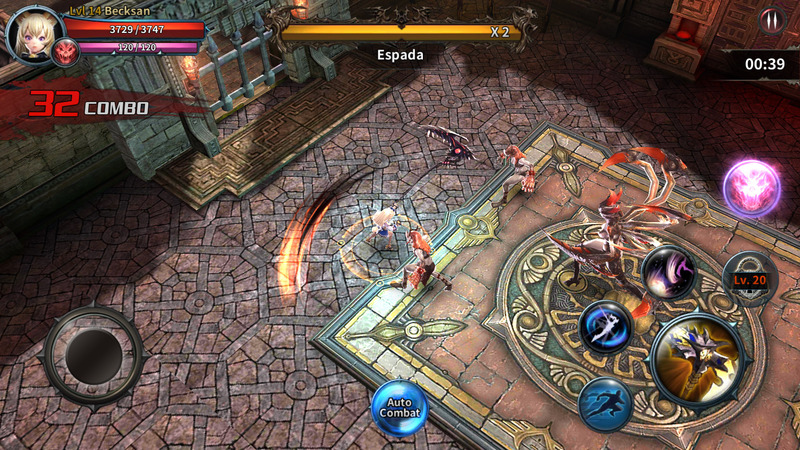 The Devilian mode can also be trigged when one fills up a little bar with all the chaos they ensue, unlocking new attacks based on the various stones that are equipped. The stones act as unique abilities such as unleashing an ultimate attack or summoning a demon to unleash hell on everyone around. It’s a simple formula that even has an auto-mode that basically beats the stage for you, so long as you’re powerful enough to do so. Unfortunately, it’s not all great as, while we were only able to get through the first four of the fifteen available chapters, the biggest complaint with Devilian was how formulaic it became. It’s very much a hack’n slasher where you’ll be swinging your weapon over and over again, but it’s how the levels are laid out that really drags. 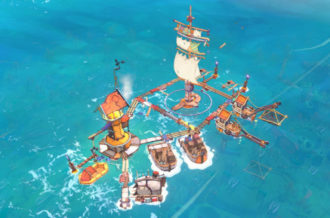 As much as the areas are neatly designed, it’s the same three or four locked battle arenas that tasks the player with defeating all the monsters that popup to move on. As much as this is supposed to be a pickup and go experience, taking as low as thirty seconds to as high as two minutes per stage, there’s no exploration at all. Adding an alternate path or two to find extra loot would benefit things dramatically, but alas, right now it feels like it just moves from corridor to corridor until the boss at the end. 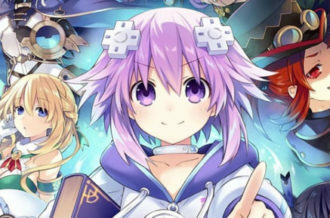 At the very least the bosses are unique, having different attack patterns and elemental attributes. 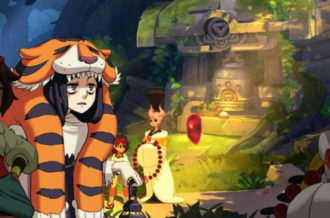 Outside of the story mode, which is portrayed primarily with stills, there’s also an Arena, Daily Dungeon, Infernal Temple and Raid activities. We weren’t able to experiment with the Raid as it requires level 20 to enter, but the rest we dug into quite a bit. The Daily Dungeon is basically as it sounds: enter a quick dungeon to obtain unique items – in this case, another in-game currency. It’s still a bit confusing, though, as each dungeon in the beta seemed to be up for the choosing instead of being dedicated to a specific day in the week. It seems to be designed for the latter which we will assume will be implemented at release. This mode is ranked in three different difficulties and will allow users to enter them three times a day. 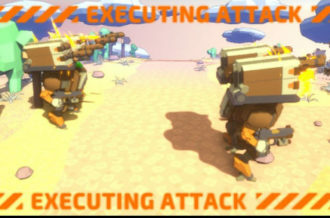 Arena is also pretty standard for an RPG such as this, battling an AI dedicated to an individual. Instead of picking from a lineup, though, players will search in a group of three, but if they don’t like the selection, they need to either wait an hour or spend gems. This seems like a strange spot to include the in-game purchases, especially tying it around a lengthy refresh rate. 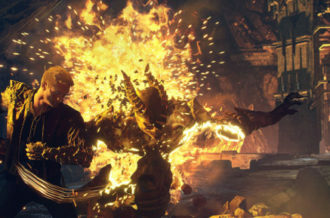 Finally, Infernal Temple is a trial mode that will trap your character in a single area with the only means of escape and collecting the rewards being beating the boss. It’s more or less what you do in the story mode, but in a single location. This can dish our great rewards, but it does require a decent amount of skill and attention; autoing it can be difficult at times. Being a closed beta, we ran into a number of technical issues throughout our short time with the game. It could be that our phone wasn’t strong enough (Nexus 5), but we ran into multiple lockups that forced us to force restart the device and general freezes when starting missions. Nothing major but somewhat expected from an unfinished product. Other small nitpicky notes we have are just that buttons could be more responsive, the “next stage” button could take the player into the next stage rather than the confirmation screen, and the back button at the top left of the screen in the inventory could move through the layered menu system instead of going straight to the general hub. From the short amount of time we had with Devilian we came away optimistic. There are elements here that have plenty of potential and then there are others that could use some work. The combat and art direction are the strongest component to the game, even though the core level design doesn’t leave much for the imagination. Regardless, Devilian for mobile is shaping up to be something special, maybe even eclipsing its PC older brother, when it launches in the near future.